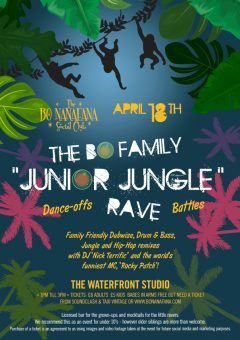 Join DJ Nick Terrific and MC Rocky Patch for the Junior Jungle Family Rave at The Waterfront Studio. 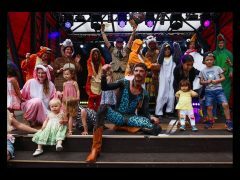 At a Junior Jungle Party you can expect only the finest cuts of Dubwise Drum and Bass, Jungle and hip hop remixes all vetted for age appropriate content, and expertly mixed live by Nick Terrific. With Bo decor, face painters and surprises, a licensed bar for the adults and mocktails for the tiny dancers. Dress Fancy if you fancy – think ‘Lions and Tigers and Bears, oh my! 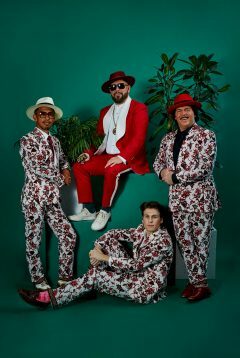 Starring The Cuban Brothers, VIBE Roulette, Fizzy Gillespie, The Sweetbeats Abigail Abi Collins, Pete Dobbing, DJ78 and Earl Harlem and more acts to be announced. 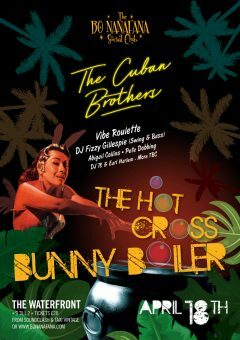 Divine and Dirty funk, soul ‘n Swing n Bass & Comedy to Pass you Over from Lent to the early hours of Good Friday! It’s Easter but with a Totally Tropical Taste. The VIBE ROULETTE wheel is waiting, displaying a thrilling compendium of musical interactivities behind every spin… Don’t like what the DJ is playing? Spin the Wheel! Don’t be a vibe-hater, be a vibe-rater! Fizzy Gillespie is a DJ & Producer who is best known for taking the Vintage sounds of 1930’s Swing to 1960’s Soul, as well as everything in between, and fusing them with modern Bass music; crossing over genres such as Drum’n’Bass, Garage, Jungle, House, Hip-Hop and other assorted beats! With walkabout and installations, and a traditional Bo Nanafana swinging away upstairs all compered by the loud and shouty Mr Pete Dobbing, you’ll be in your own little tropical Paradise.